The Munson Institute is the leading, and often sole, center for the teaching of maritime history in the United States. Its faculty includes top maritime historians in the United States. New for 2019 are two fully funded scholarship opportunities to live and study at Mystic Seaport Museum, America’s largest maritime museum, while earning transferrable graduate credit through the University of Connecticut. To learn more, go to Paul Cuffe Memorial Fellowship. 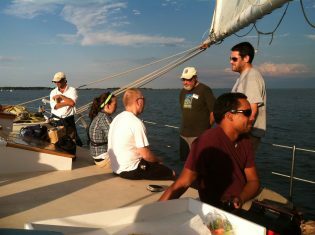 The mission of the Munson Institute is to promote the advanced study of and dissemination of information about the American maritime experience. The Munson Institute, operating at Mystic Seaport Museum in Mystic, Connecticut since 1955, promotes learning, research and the sharing of knowledge through annual summer-time graduate courses in American maritime history, the support of research, and the dissemination of information through occasional lectures, conferences, networking and the Paul Cuffe Memorial Fellowship. The Frank C. Munson Institute of American Maritime Studies at Mystic Seaport Museum was founded in 1955 by the late Edouard Stackpole, then curator of the Museum, and the late Robert Albion, Gardiner Professor of Oceanic History at Harvard University. The graduate program was endowed by Cora Mallory Munson of historic Mystic’s Mallory family, in honor of her husband, shipping magnate Frank C. Munson. The Munson Institute “served as the Museum’s department of higher education,” wrote its director Ben Labaree in 1995. He noted then that “a remarkable number of museum directors and curators in the maritime field are graduates of the Munson Institute program,” while today it might be added that, having used the vast collections at Mystic Seaport, a substantial number of professors at colleges and universities around the country are also Munson alumni. The Munson Institute also awards the Paul Cuffe Fellowship annually to scholars researching the role of minority groups in maritime America. The body of research amassed by Cuffe recipients and Munson graduates has added greatly to the multicultural face of American history, providing important resources in the examination of maritime Americans. More recently, the Munson graduate program has incorporated new scholarship with an environmental focus. 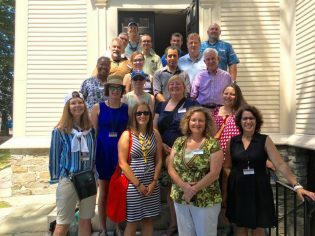 The Munson Institute was honored to host prestigious NEH Summer Institutes for College and University Faculty in 2006, 2010, 2012, 2014, 2016, and 2018. The graduates of these special institutes have since joined scores of other faculty members across the country who now teach history through a maritime lens as they combine social and cultural approaches to the past with Munson’s new focus on environmental history. Applications are considered on a rolling basis, but space is limited. For additional information, please email munson@mysticseaport.org or call 860.572.0711, ext. 5089.